Casino Deposit Methods are what players use when they are trying to get money deposited into a real player account. Since all people don’t have access to the same kind of method there are several available for example Neteller, Click2Pay, Moneybookers, FirePay, 900Pay, Citadel, PrePaid ATM, Wire Transfer, and ACH. 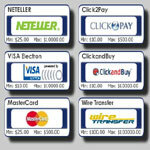 Neteller is one of the most popular methods around today. They provide some of the fastest and most secure ways to transfer money online. One of the main reasons people love this option so much is because they can utilize same day payments and virtually instant cash transfers. Click2Pay and Moneybookers are also very popular because it is almost instant and they do most of the work for you, they transfer funds from a bank account or credit card to the account and carry out the payment. FirePay is also one of the most popular because they work just like a credit card, only they use a bank account instead, as soon as the bank account is funded the FirePay account is ready to be used. 900 Pay is probably one of the easiest and most private payment options, this lets players deposit anywhere from $75 to $150 into a casino account and have the money charged directly to their phone bill. There is no credit card or bank info needed which is why so many people prefer this method. Citadel and ACH are both electronic check services that can be used by anyone who has a bank account that is located in the United States and that can have checks payable in US Dollars. Prepaid ATM is a very private method to use when playing online, it can be funded in several different ways, then the player can simply use that card to fund a casino account without having to give out credit card numbers or bank account numbers.